When cutting out the parts for a project, I usually start by planning my cut list to cut around the defect, or have the ugliest side of the board face towards the back. I have also filled many knotholes with epoxy, which creates a nice affect. However, before modern day epoxies it was standard practice to inlay a Dutchman over the defect to cover it up. By using a similar piece of wood, one would hope it would blend in, and not be noticeable. But what to do if the defect is too big to use a Dutchman to cover it up? Well a large defect was what I was up against in a recent project when a customer brought me a cross section of a stump he wanted made into a table. The cross section had an unusual and beautiful shape; it was well worth saving. 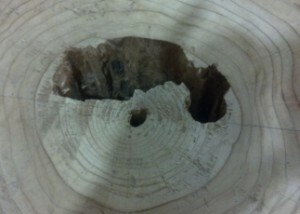 The only problem was that the center of the stump was rotted out. He left it to me to figure out how to fill it in and make it look good. My first thought was to try to figure out how do a bow tie inlay across the rotted area, but I just couldn’t make it look right. So I started playing around with cutting a circle to inlay over the section. The circle looked too forced. 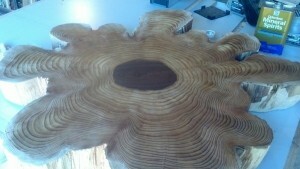 I finally settled on inlaying an accent wood so it would follow the shape of the growth rings of the stump. To create the inlay I used a piece of tracing paper and picked a growth ring to trace. I dug through my scrap bin and found a walnut cut off that had a small knot in it, with growth rings radiating out from the knot. I used some spray adhesive to attach the tracing paper to the walnut, taking special care to align the knot in the center. I went to the scroll saw and carefully cut out the shape. Once the shape was cut out, I used an inlay router bit kit, to cut out the inverse shape of my plug to use as a template to cut out the recessed shape on the stump. I fine-tuned the template with sandpaper, used double stick tape, taping it to the stump taking care to align the shape of the template to the growth ring, and then routed out the shape. The router bit kit did a perfect job of copying the accent plug I made; it fit in place with a little tap from my mallet and was snug all the way around. I glued it in and sanded it flush. The rotted area may have been too big for a Dutchman but it was perfect for a custom accent inlay. 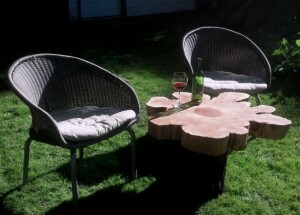 Brian Benham has made his lifelong passion for woodworking his profession. He enjoys taking his clients ideas and combining them with traditional woodworking techniques to create a unique piece of furniture. Thank you, will help with my problem. patch with a patch..
As good a story an article as this is I would have loved to see a better picture of the finished described actions. Great job though.